As a green smoothie fanatic, I love experimenting with new ingredients for my recipes and over the years I have created some of the best but also some of the worst green smoothies. But that’s the fun of blending, some recipes work and others simply don’t. 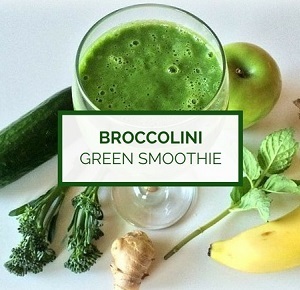 Broccolini is definitely not the first vegetable you’d think of when experimenting with green smoothies. And not surprisingly, it’s very hard to find any broccolini smoothie recipes on the Internet either. But that doesn’t mean we can’t try it! So I figured, let’s start experimenting with broccolini and see how it works out. But first let’s have a closer look at what broccolini actually is. Please find the printable version of this recipe further below. We all know broccoli, but broccolini is still a bit of a mystery to some. Broccolini looks and tastes similar to broccoli but they are in fact quite different. Broccolini has much longer and thinner stems than broccoli does and it also has much smaller florets. This somewhat trendy vegetable was developed in 1993 by the Sakata Seed Company of Yokohama as a cross between broccoli and Chinese broccoli, named “aspabroc”. In Australia, the name broccolini is even trademarked. Broccolini often gets confused with baby broccoli but they are not the same. Broccolini is sweeter and more mild than broccoli or baby broccoli. Excited about broccolini? A very versatile green, broccolini can be steamed, roasted, sautéed and grilled. Check out this recipe for basic broccolini as a healthy side dish. I’ve tried a lot of different combinations of greens and fruits with broccolini as the main ingredient, and I feel that the below recipe works best. With every green smoothie I prepare, the health benefits come first. For me it’s most important that the green smoothie I prepare is the healthiest possible, and taste comes second. I must admit, friends and family sometimes do avoid drinking my green smoothies because they expect something super sweet and delicious. But my taste buds have changed slightly over the years and I’ve become used to drinking smoothies that are prepared with health benefits in mind. But please don’t let this put you off! The green drink that you can make from the below recipe is not only incredibly healthy, it’s also very refreshing and tasteful. It may not be for everyone, but I love it. 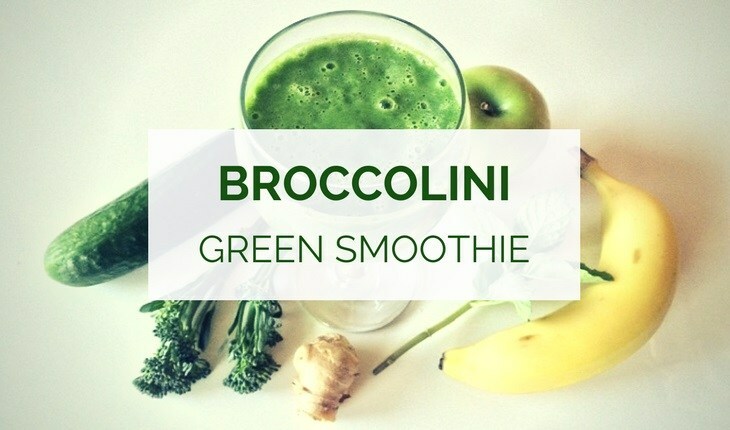 So let’s have a look at what else goes into this broccolini green smoothie, apart from the broccolini of course. If you like your smoothies to taste a bit sweeter, you could add an extra banana or apple, or perhaps add a bit of honey. Broccolini can easily be consumed raw, but otherwise you can also cook it for two minutes before blending. One cup of coconut water can add a lot of extra freshness to this green smoothie, and honey adds a nice touch of sweetness, if that’s what you prefer. I personally love the flavor of this green smoothie, but it really must be consumed cold. So make sure you let it sit in the fridge for at least an hour or so before drinking, in case you don’t have enough ice cubes handy. 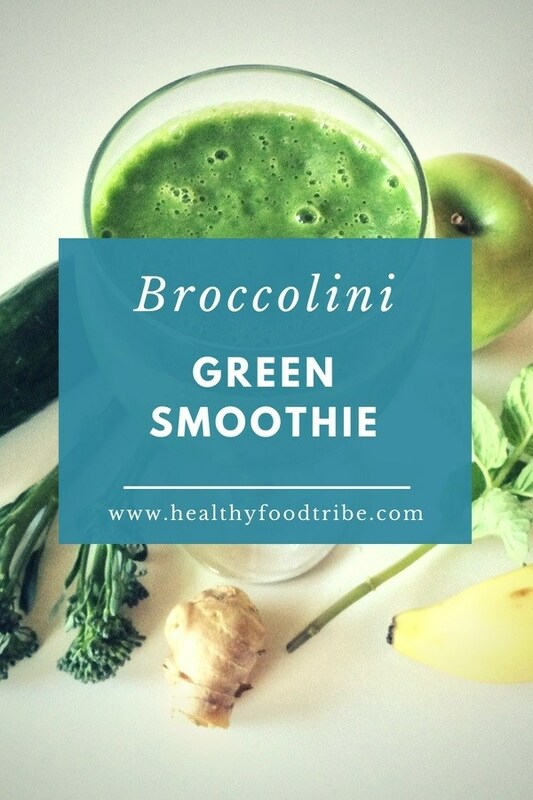 I actually don’t like broccoli or broccolini as much as I like other greens such as spinach and kale, but I find this smoothie very tasty and revitalizing. The health benefits are great too, so I challenge you to try it out yourself! Love green smoothies as much as I do? Find more healthy green smoothie recipes and tips. Are you thinking to buy a new quality blender? Please check out my list of best blenders for green smoothies. Do you prefer juicing over blending? Have a look at my recommendations for best juicers. 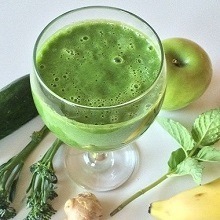 A nutritious broccolini green smoothie recipe with apple, cucumber, mint and ginger. Cut the broccolini, apples and cucumbers in smaller pieces. The apples can actually be blended with skin and seeds. Add the ingredients in the blender in the following order: bananas, broccolini, mint, cucumbers, apples, ginger, water and ice cubes. Blend at high speed for 30 seconds, followed by 30-60 seconds at low speed. Do you enjoy reading this type of content? Subscribe now and receive all the latest straight to your mailbox!